A wide range of problems are typically evaluated using Microsoft Excel. These include financial models, sales forecasts and cost estimates, but there are many other types of problems for which a spreadsheet modeling environment is also suited. An Excel model will only provide a single estimate of the outcome being modeled so it is common practice to use a risk analysis Excel add-in that performs a Monte Carlo simulation to assess the uncertainty around the results. 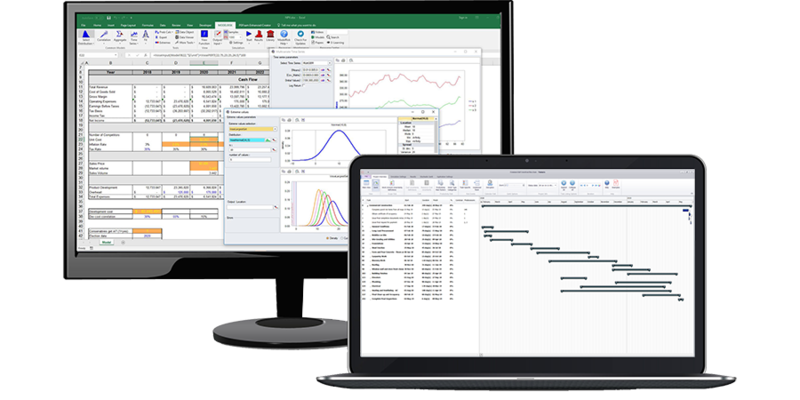 Palisade Corporation develops add-ins for Excel, including BigPicture - a diagramming software add-in, Evolver – an optimizer add-in, PrecisionTree – a decision tree drawing add-in, StatTools – a basic statistical analysis add-in, and NeuralTools – a basic neural network add-in. Vose Software develops a range of integrated risk analysis software products that operate in different environments. They include Pelican – a web-based enterprise risk management system, Tamara – a stand-alone project risk analysis tool, StopRisk – an operation risk analysis tool for banks, and ModelRisk Cloud – a web-based system for deploying risk analysis models. @RISK comes in Professional and Industrial editions. ModelRisk comes in Basic (free) and Complete editions. The @RISK Industrial and ModelRisk Complete editions are the most similar, and are therefore compared here. perform the same operation of randomly sampling from Triangle distribution. During basic simulation runs, the products will run at about the same speed unless you have more than 2 CPUs on your computer (@RISK only supports 3+ CPUs in their Industrial version). They both allow an unlimited number of samples, include the ability to set seed values, offer live updating during simulation and running multiple simulations together, and use the same default random number generator. After recent @RISK releases, both products now use the exact same methods for correlation, distribution fitting, distribution splicing, and offer the same range of graphical reports. Both products have a converter for Crystal Ball models. ModelRisk also provides a converter for @RISK models. but there are other, even more interesting differences than the cost saving! Aside from the dramatically larger cost of @RISK, there are also a number of other important differences. Simulation experiments were conducted using @RISK example models and equivalent ModelRisk models with no change in logic. 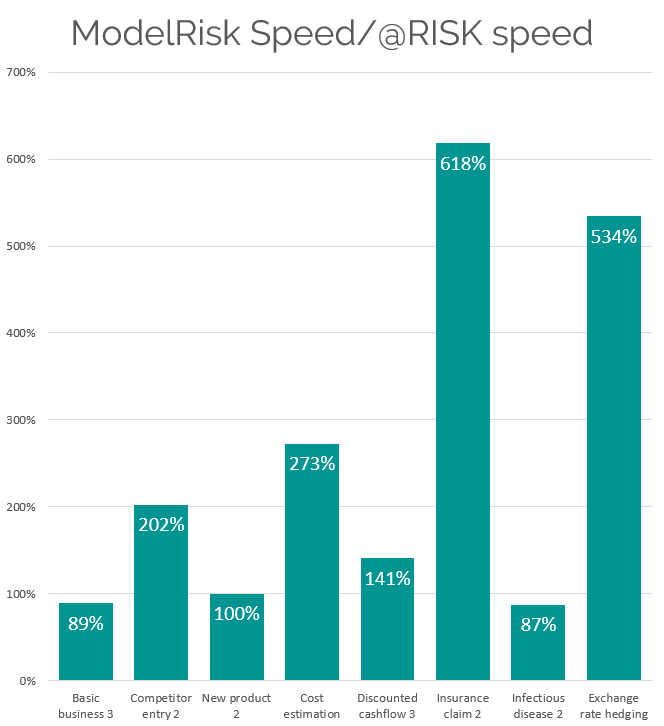 At worst, ModelRisk achieved 87% of @RISK’s speed and at best 618% (i.e. six times faster). HOWEVER, please be aware that this experiment was conducted using the trial version of @RISK which uses all 8 of the CPUs in the test computer, whereas the Professional edition is limited to using just 2 CPUs, so would presumably run at a quarter of the speed produced in these tests. ModelRisk provides about three times as many distributions as @RISK. ModelRisk offers a wide range of additional tools that simplify model building and allow the creation of vastly smaller and faster models - for example, StopSum, SumProduct, the Extremes toolset, and Combined. @RISK is available in several languages. ModelRisk is currently only available in English. ModelRisk Complete also has a vast number of visual interfaces to help you. 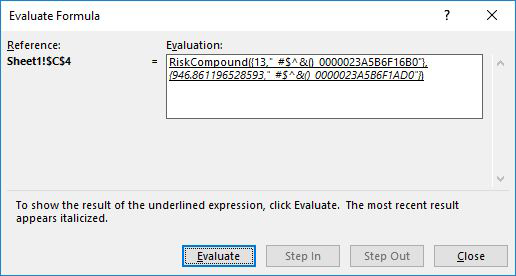 Select a cell with a ModelRisk function, click the View Function icon, and the interface for that function will pop up, showing you precisely what the function is doing. Click on the images below to see each interface in detail. 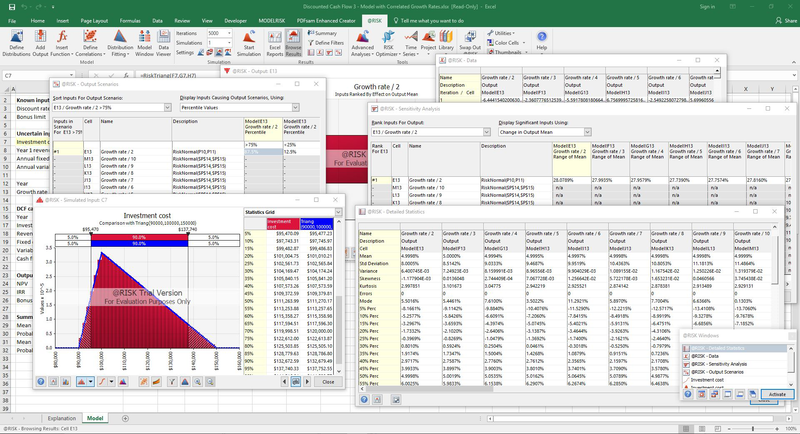 @RISK incorporates the ability to simulate uncertainty in a schedule built in Microsoft Project, by building a duplicate of the Gantt chart in Excel and swapping simulation data between Excel and Project. 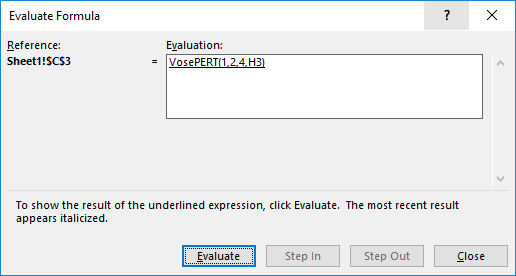 Vose Software, in contrast, offers a separate product called Tamara that imports MS project or Primavera files, and which share simulation results with ModelRisk. Tamara can handle schedules of almost any size and runs several hundred times faster than @RISK. The method of displaying and sharing reports is completely different. 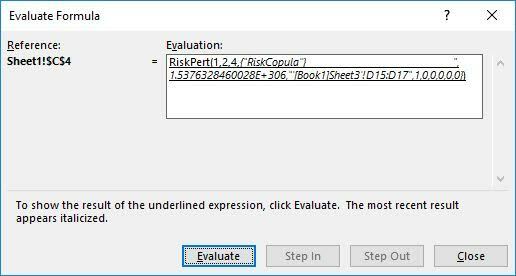 ModelRisk uses the Results Viewer, which contains all the simulation results within one location, and where a new tab is created for each new graph or table required. ModelRisk’s Results Viewer remembers all graphs and tables that have been created, and will reproduce the same report the next time the model is run, even if that model is run on another computer. The Results Viewer can also be used independently of ModelRisk, so a modeler can send a colleague a ModelRisk results file instead of the colleague needing a copy of ModelRisk and running it themself. The Results Viewer also allows the user to export the entire report in one go to PDF, PowerPoint, Word or Excel. With @RISK, one either has to create a report in Excel or create graphs one at a time, copy each graph as a bitmap, and then paste into another document. ModelRisk offers a unique ability we call ‘Objects’, giving the user the ability to define the random variable that is to be used. 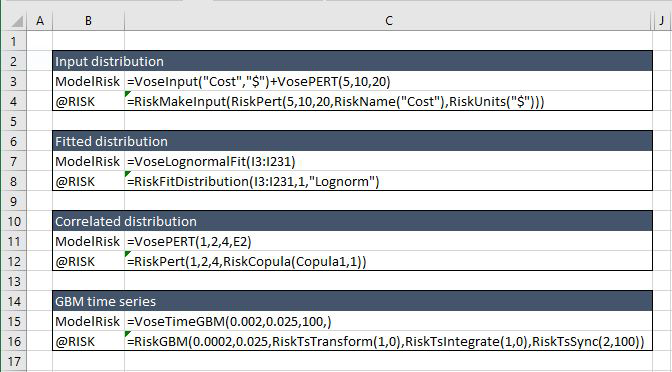 Objects can be used with many more advanced ModelRisk functions, often greatly simplify a model, and ensure that we can offer powerful functions that are consistent with Excel’s evaluation process. The VoseLognormalObject function has returned a text result describing the distribution which the VoseAggregateMC will then take (in this case 7, the result of evaluating the VosePoisson function) samples from. Note that the ModelRisk evaluation occurs in a single step, which apart from being transparent also has the benefit of being much faster. 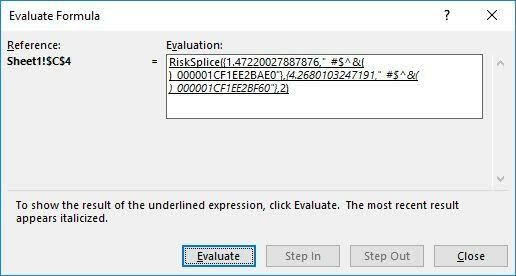 @RISK has had to force Excel to behave in a completely different way - the two parameters are not evaluated in the usual way as required by Excel, but instead each is converted into a complex array of indecipherable code. 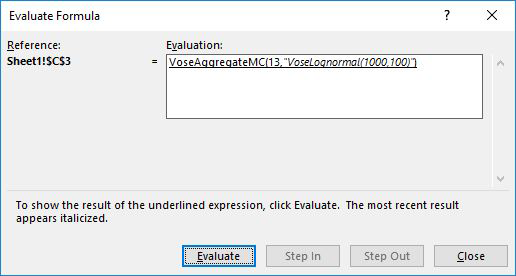 Since it is no longer obeying Excel’s rules for function evaluation, the user can no longer be sure of what the function is doing. Interested in a trial of ModelRisk?